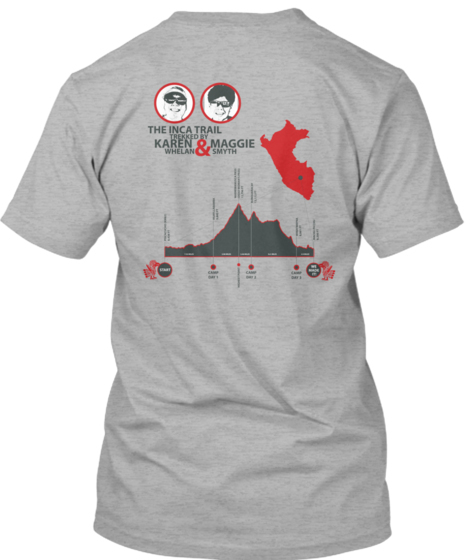 So my friend Sonya Vasilief designed us a shirt for the trek. We launched a campaign on Teespring. Teespring is a site where you can put up a shirt, set a minimum sale and if you don’t meet it, you can walk away…nobody is out a dime. We set ours up at the cost Teespring charged for the shirt and printing. I am quite happy about the shirts! We have v-neck tees, long sleeved tees, hoodies and woman’s fitted tees. You can get them in white or grey. We have ten days to hit the minimum (or go over) and then it is sealed and printed. IF you want one and live in Vegas, you can save on shipping as you can just pick them up from me. 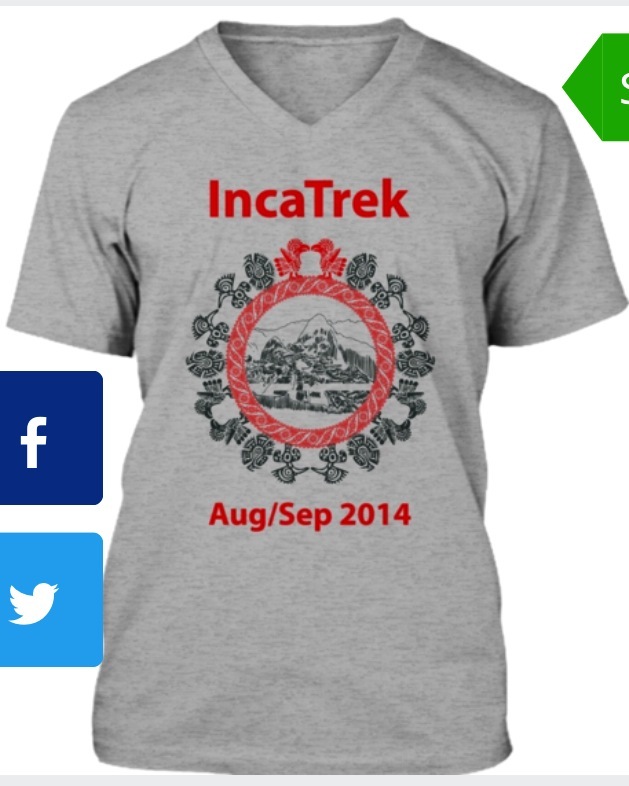 Here is the link to order INCATREK 2014 SHIRTS. This is the back of the shirt. It actually shows the mileage per day, the altitude we are at and where we sleep. This is an INTERACTIVE shirt because when we are encouraging shirt purchasers to wear their shirt for two events. 2) GET WRECKED AT THE RUINS on Friday, September 4, 2014. That night, we will have completed all of the more than 30 miles and cray cray elevation us and downs of the trip. So once we are safe at our hotel at Agua Cliente, we will be relaxing with a coooooool libation and would like you to join us. So on those two days, wear your shirts and join us by posting on our Facebook page at WhelanTrek or comment here at the blog. Time is limited as the campaign ends August 10, 2014 so that the shirts can get sent out in time to interact with us! Thanks for all the support we are getting for this event. We love the encouragement an are looking forward to reporting all of the real time excitement back to you! Posted on July 31, 2014, in Hiking and tagged incatrek, incatrek teeshirts, Machu Picchu, Sonya Vasilief, teespring, Trek, trekking. Bookmark the permalink. 1 Comment.